First off, hi! Long time! How have you been? Uhuh... yeah... how 'bout the kids/dog/fish? Some winter we're having, eh? Speaking of the winter that refuses to end, I have been riding my bicycle in it. I had a spell where I kind of stopped, but thankfully I've been back on the saddle for a few weeks and loving it as always. Anyone who has come across the right bit of gear can attest to the fact that it can make a big difference to your enjoyment of any physical activity. In my case, I got tired of being attached to my pedals in dicey icy snowy kooky road conditions, and I've gone back to a cleatless, "normal" shoe and pedal for winter riding. Finding just the right thing proved very easy. Like so many romantic comedies prove, sometimes your heart's desire is right in front of you the whole time... you just need to see it! So what is "essential" about an old pair of shoes? Nothing, of course. Because nothing is essential other than a bike and some attention to what hurts. If it freezes, cover it up. Whether you cover it with the sweetest bit of expensive bike gear or a chunk of tape don't matter none. That is essential. If you get my drift. Hi, Rantwick! Glad to see you back! 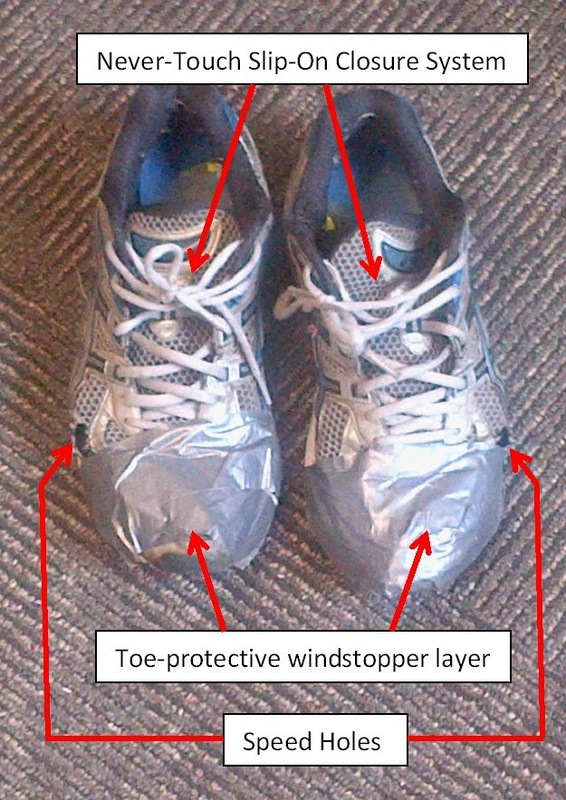 I have a pair of shoes that look JUST like those, minus the tape. Speed holes are included, though! I use mine for camping/horseback riding/farm work/cycle commuting. :) Great minds, right? Great minds is right! Glad somebody is still out there! I've used the family chariot or got a ride when below -15C. When your breath freezes in front of you and drops to the ground, it's too darn cold. Other than that, I've been out riding, too. The street bike lanes are nearly mound free, now, although they are a bit like off-road with the sand and salt cover. I've stuck with the clipless and booties, although I've had to repair the covers and the velcro is nearly gone. Maybe next season I'll "spring" (ha, ha, joke) for the all-in-one boot/cover I almost bought in December. Hey Richard! I've been out there for some but not all of those really cold days... the ride home from work today at +1 C was really nice. I never thought I would want out of my clipless, but this winter's conditions changed my tune a bit. When I have been out there this winter, I've used the reverse side of toe clips (just pedal), anything to feel more stable. Those are not "Speed Holes," they're "Sock Scoops." Steve - They are Speed Holes. Attempts to modify or re-imagine my design will result in speedy legal action. You have been warned. Dude - Good to see alive & kicking with them sneakers. I switched over to regular shoes back in Dallas, sometime in 2009 or 2010. I have stuck to regular shoes since. I had some issues with frozen toes (for a former Texan). Had to get my shoes examined. Again, good to have you back, pal. Hey, thanks Chandra. Always nice when you drop in; you're always such a source of good vibes. Nice to see a new posting! I could write a long, tiresome comment about what shoes work when, but I won't. What works is whatever you find comfortable enough to use. Good to see you reporting in. Hey, hey, hey...it is good to hear from you. When I first started riding in the winter, my shoes looked just like that. In fact if I look around, I bet I still have them.